Which Flat Top Grill Works Best for Me? We know that some of the best memories are made around a dinner table. Creating quality products engineered for all types of families allows us to embody the family brand that we’ve been preaching for over 30 years. The Camp Chef Flat Top Grill line was designed for just that. We’ve carefully crafted three universal sizes to assist you in feeding the family or cooking for a crowd. 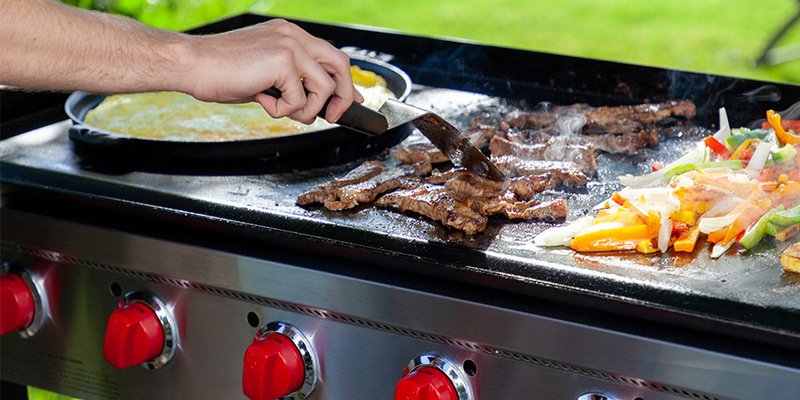 Gone are the days of hot spots—the Camp Chef Flat Top Grill line has True Seasoned, non-sick surface—perfect for breakfast, lunch, or dinner. The smallest of the Camp Chef Flat Top fleet is the ever powerful VersaTop. With one mighty 15,000 BTU/Hr. burner, you’ll be able to fit 9 medium-sized burger patties on a 247-square inch surface. The VersaTop is the only flat top that is part of Camp Chef’s 14-inch modular cooking family. Included in your purchase is a 14-inch True Seasoned, non-stick griddle surface. Conveniently swap out your griddle for a pizza oven or grill box! The compact design allows for you to take the VersaTop grill system anywhere. 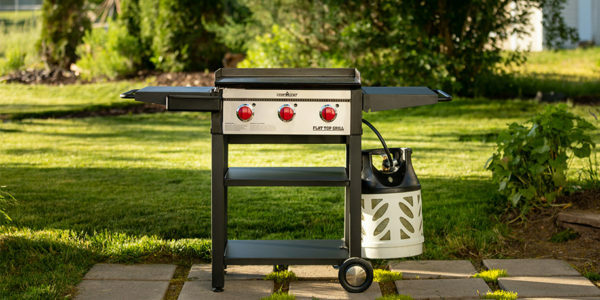 With leg stabilizers, and all the bells and whistles of a full sized Camp Chef Flat Top Grill, this might just be your favorite. Perfect for both balconies and extravagant patios. With three mighty burners you’ll be able to feed the entire family. Its small design is great for balconys or back patios. Fit 16 medium-sized burger patties on the 468-square inch cooking surface. Fire up the burners and get sizzling. 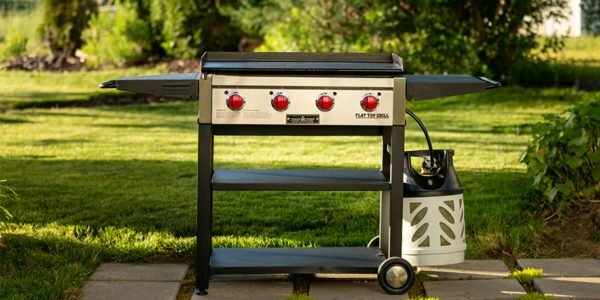 The Flat Top 600 is our most versatile flat top grill. It’s the perfect size to prepare delicious entrees while not having to compromise on space. 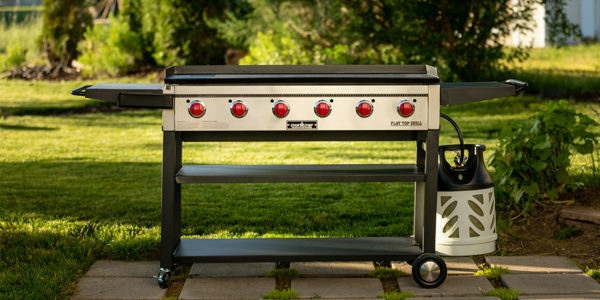 More importantly, the Flat Top 600 comes with a removable flat top griddle that exposes a hidden grill grate. Use this flat top as a griddle, grill, or a water pot heat source. Comfortably fit 24 medium-sized burger patties on this 604-square inch cooking surface. The Flat Top Grill 900 is a crowd pleaser to say the least. It’s our largest flat top grill unit with 877-square inches of cook space. Crank out 40 strips of bacon, 72 brats, and 36 jumbo burgers per batch with six reliable burners. We suggest upgrading or purchasing the Flat Top 900 if you have a sizable family or regularly entertain for large parties. Hence—the crowd pleaser. Which Flat Top Grill will you be purchasing and why? Let us know in the comment section below! Wondering if the 900 has interchangeable grill/griddle like the 600. It would be awesome if one could set it up as half grill half griddle and or all one or the other. That would make it ALOT more attractive. Also, adjustable gas orifices so that it could be converted quickly and easily to natural gas use and then back to propane . That would be a very nice feature. As a flat top this big is great for camping where propane is the fuel BUT would also be so great to use on the deck all the time at home if one had a natural gas outlet. Unfortunately, the Flat Top 900 does not have an interchangeable grill/griddle. wich model do you suggest me? can I find it in a store close to Montreal? if not, how long it will take for delivery? Unfortunately, no. Our flat top grills are not able to be detached and used as a standalone tabletop griddle.